Aston Villa boss Paul Lambert insists there is no grudge between himself and Chelsea counterpart Jose Mourinho following their touchline spat earlier this season. 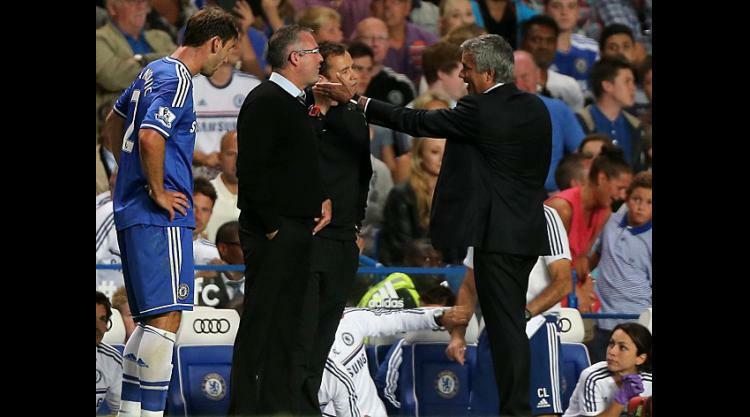 Lambert goes toe-to-toe with Mourinho again this weekend reminded of their confrontation at Stamford Bridge at the start of the campaign. The Scot was infuriated when Blues defender Branislav Ivanovic escaped a red card for an alleged elbow on Christian Benteke before going on to score the winner in a 2-1 defeat for Villa. Lambert was also fuming when a penalty appeal was turned down, prompting angry scenes between the two managers. Villa's manager insisted such feisty altercations are part and parcel of the game but claims both men laughed off the incident. "Do you know what, there was nothing in that at all," he said. "We had a laugh and a joke about it afterwards. It was nothing serious. There was nothing in that, people made a lot of it in the way they portrayed it. We had a laugh and a joke as you normally do in football. "Nobody is there to be Mr Nice but it never transferred into any heated thing. I saw him after the game and it was totally fine. I'm pretty sure it will be the same this time." Ahead of Saturday's tea-time Barclays Premier League clash with the leaders, Lambert added: "I had a drink with Jose after the match. There was never any (issue). "I think people tried to make something out of it that was never there." Villa will be without on-loan left-back Ryan Bertrand when they face his parent club. The 24-year-old's ineligibility opens the door to Joe Bennett or Antonio Luna, who are competing for his spot in Paul Lambert's XI. Fernando Torres could be included in Chelsea's squad as his groin injury was not as bad as was first feared. The striker withdrew from the starting Iine-up following the warm-up prior to the 4-0 defeat of Tottenham, but could play at Villa Park or be saved for next Tuesday's Champions League contest with Galatasaray. Defenders David Luiz (groin) and Ashley Cole (knee) remain out. Mourinho believes Chelsea are ahead of schedule in challenging for the Premier League title this term, but still believes the destination of the trophy is out of their hands. The Blues could go 10 points clear of Arsenal and Liverpool, who enter the weekend in joint-second place and each play on Sunday, with victory at Aston Villa on Saturday but Mourinho maintains the table is not accurate. Manchester City, who are nine points adrift with three games in hand, are Mourinho's title favourites and Chelsea hope to keep their composure entering the remaining nine games, beginning at Villa Park. "The team is motivated and the team is strong and the team has a good mentality and a good spirit, but not because of the table," Mourinho said. "They know the table is fake. What they also know is that every match we have to try to win, every match we have to try to improve. "We have clear objectives for next season. If we can do it this season, we don't say no. "We are very calm, we are very relaxed. I think that's important." Mourinho would not be drawn on how many points Chelsea, who have 66 after 29 games, would need to win the Premier League. "I don't want to think about it," he said. "Tomorrow we have a match, a very difficult one. Three points would be fabulous. "One point is not a bad result at Villa Park. Zero points would be a negative result. "After Villa comes Arsenal (on March 22) for the Premier League and we go match by match."